Please note that the content of this book primarily consists of articles available from Wikipedia or other free sources online. 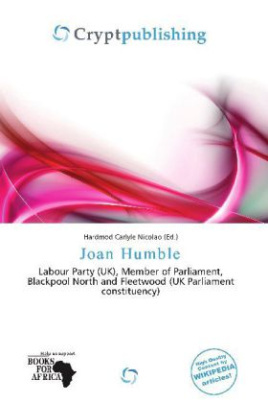 Jovanka (Joan) Humble (born 3 March 1951) is a British Labour Party politician, who was the Member of Parliament (MP) for Blackpool North and Fleetwood from 1997 to 2010. Born, Jovanka Piplica, Joan Humble was educated at Keighley Girls (now known as Greenhead High School) and Lancaster University where she received a BA degree in History in 1972. She worked as a civil servant in the Department of Health and Social Security from 1972, before moving to the Inland Revenue in 1973. She left the civil service in 1977 to raise her two daughters. She served as a school governor for fifteen years from 1982. In 1985, she was elected as a councillor to Lancashire County Council where she served until her election to Parliament.